Golf clinics at golf school "De Hoge Dijk"
A golf clinic is an excellent way to entertain employees or business associates. We’re even happy to host your birthday, party, or family reunion. On Amsterdam’s perimeter, right next to rural Abcoude, Golf School & Driving Range “De Hoge Dijk” offers a state of art practice facility. You and your company, club, or mates can design your own clinic, we are happy to familiarize you with golf. Age is irrelevant, as is experience: we have a team of qualified teaching pros at your service. Just bring comfortable clothing and good shoes, we have locker rooms and showers in our club house. If so desired, an on-course clinic can be added to the program. An on-course clinic take 2 hours, and will take you to one of the courses on “The Hoge Dijk” with a teaching pro. You will quickly find out who is the most talented in your group, who hist a hole-in-one, etc. 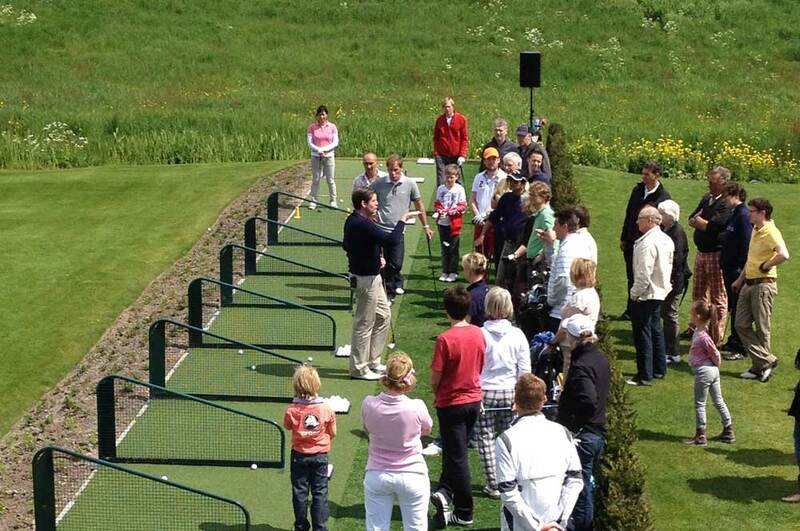 The cost for a golf clinic is €17,50 per person per hour, including equipment. We’d love to hear from you if you have any questions, or want to make a reservation. Just mail us at brian@golfeventsamsterdam.nl or call us at +31 (0) 294-288142.